The Book brothers—James, Herbert and Frank—earned their wealth in real estate and property development in Detroit at the end of the Nineteenth and into the early Twentieth centuries. They are, perhaps, best known for their attempts to make Washington Boulevard into a Detroit shopping area that would rival Fifth Avenue in New York. Before the First World War, the Book brothers realized that Detroit would become the center for a prosperous and large vehicle industry. This meant that Detroit would need a downtown with many major office buildings and places for the affluent to spend their substantial incomes. Being real estate entrepreneurs, they decided to revitalize the Washington Boulevard area between Michigan and Grand Circus Park into an upscale site for office buildings and elegant retail shops. At the time they started, Washington Boulevard was lined with small low rise late Nineteenth Century structures. With the Book’s backing, the Book Cadillac Hotel was constructed at Michigan and Washington and, along Washington Boulevard, they encouraged or sponsored the erection of the Book Building, the tall Book Tower and the Industrial Bank Building, all designed by their favorite architect, Louis Kamper. James Burgess Book, I assumed, wanted a residence for his family that would reflect his accomplishments and his wealth. He choose the Indian Village area and, at the corner of Burns and East Jefferson, had Louis Kamper design the beautiful home that you see pictured above. This home resembles the Petit Trianon at Versailles. 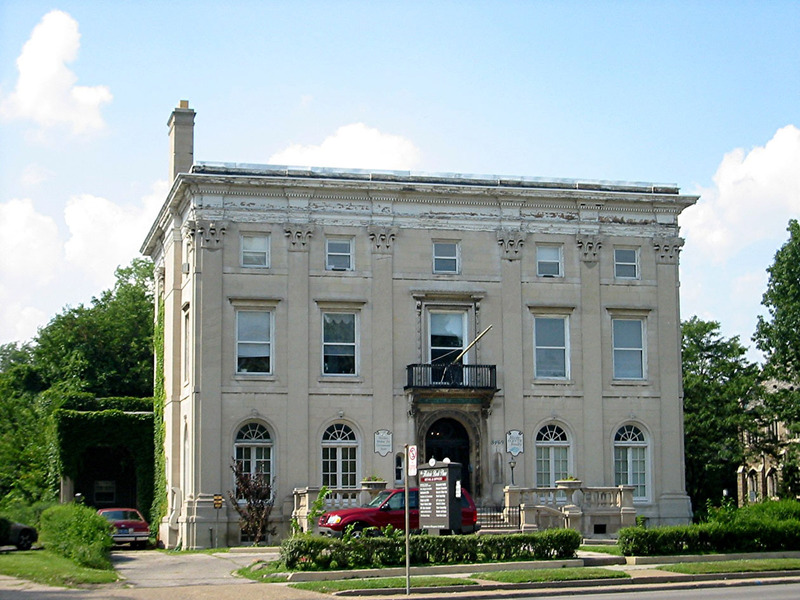 I do not know if James Burgess Book specified that he wanted a residence similar to the one that King Louis IV commissioned or if Louis Kamper suggested to Book that the Petit Trianon would be an ideal model for an elegant home to be erected on East Jefferson. Whatever their deliberations, Kamper designed the classically Eighteenth Century French style home that you see pictured above. The Palace of Versailles was the residence of the rulers of France from 1682 until the Revolution ended terminated their power in 1789. It was, in effect, the home of the French government. Versailles is located about twenty kilometers from the center of Paris. In 1622, Louis XIII purchased woods there and then had a small chateau built to serve as a hunting lodge. In the 1650s, King Louis XIV apparently grew tired of the bustle and political conflict occurring in Paris so he commissioned his architect, Louis Le Vau to expand the chateau into a castle. He also instructed his landscape architect, Le Nôtre, design elegant royal gardens. Then he decreed that as of May 6, 1682, Versailles would be the home of the French government. For a century, the kings of France recruited the most skilled architects and landscape designers to build the magnificent structures that we now see in Versailles. Under King Louis XIV, there were four major building campaigns there. And, under King Louis XV, there was extensive additional building. If you wish to appreciate classical French architecture and design of that era, these kings provided a marvelous array of buildings and gardens. And now the Metro can whisk you there quickly from any point in metropolitan Paris. The Petit Trianon that Louis Kamper selected as a model for the East Jefferson home pictured above, was a small chateau that King Louis XV had architect Ange-Jacques Gabriel design for his mistress, Madam de Pompadour. It was begun in 1762 and completed in 1768 but the mistress died in 1764. Louis XV then used the Petit Trianon as a home for a different mistress, Madam du Barry. In 1774, Louis XVI replaced Louis XV on the French throne. He gave the Petit Trianon to his 19 year old bride, Marie Antoinette. She apparently detested court life so she lived at the Petit Trianon rather than in the most more elaborate Palais de Versailles. After the Revolution, parts of Versailles fell into disrepair but, throughout the Nineteenth and Twentieth century, many of the elegant buildings were used for governmental purposes, especially for ceremonial occasion such as the signing of treaties. Versailles eventually grew into an upscale suburb of Paris. Most of all of the buildings from the Seventeenth and Eighteenth century have been excellently preserved as Versailles became one of the most important tourist destinations in Europe. When you look at the Book home in Detroit and realize its similarity to the Petit Trianon, you might ask if there is a Grand Trianon. There is, indeed. And, so far as I know, it has not served as a model for any structure in the United States, presumably because of its grand size and extensive gardens. The Grand Trianon – much larger than the Petit Trianon – was built by King Louis XIV as a place of retreat and to serve as a residence for his mistress, Marquise de Montespan. It was designed by the court’s architect, Louis Le Vau and built between 1660 and 1672. The name Trianon comes from a small village on the outskirts of Versailles that was taken over during the reign of King Louis XIV when he greatly expanded the buildings of the French court at Versailles. In August, 2010, the city of Detroit’s Brownfield Board in conjunction with the Detroit Economic Growth Authority approved a 300 thousand dollar tax credit for the restoration of the James Burgess Book residence. A total of 1.5 million dollars was scheduled to be spent to renovate Detroit’s version of the Petit Trianon so that it may serve as a home for the Ars Poetica Chamber Orchestra. The refurbished home will also provide office space, a conservatory, a retail music store and an apartment. State of Michigan Register of Historic Sites: This home is within the Indian Village Historic District that is listed on the State register. National Register of Historic Places: This home is in the Indian Village Historic District and is also listed as a component of the East Jefferson Avenue Residential Thematic Resource on the National Register of Historic Places.